BEHOLD MY NEW DESKTOP! Yeah yeah, I know it's one hell of a change in just one day, but I just felt my desktop was freaking neutral and yucky, so I invested 4-5 hours of my time to LITERALLY PIMP MY DESKTOP. 1.First you need an XP theme. But installing isn't as easy as it sounds. You need some steps done before seeing any real change. a)Go to [link] and look for a theme you like. This is one of the best pages if you're looking for a change! 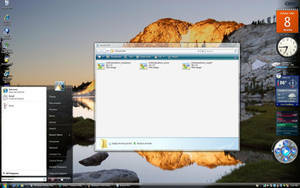 b)For instructions on how to install the XP theme, go to [link] . The tutorial is extremely well explained, and the software is 100% safe to download. (Personally recommend UXTheme Multi-Patcher). When you've already installed UXTheme Multi-Patcher, ran it, and installed the XP theme, then move to step 2. 2.For the navigation bar at the bottom of the screen, I used a cool software called "Rocketdock". It's awesome for this kind of things, very flexible and customizable. 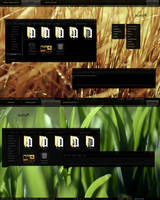 Download it at [link] , then install it and place it at any position on your screen by changing the "dock properties". (It's the little hammer, or so I remember). -Right click an icon>icon settings>"+" sign>look for the files' location. -Select the folder and then: hit "ok">change the default icons to the new ones>browse>find the most suiting icon>hit "ok"
Done! now repeat with every icon you like. The fan effect is a little tricky, but luckily there's a video where it is explained very well. 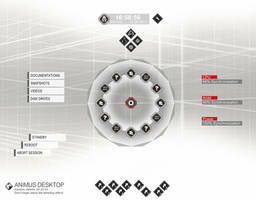 3.The pc's status are awesome. They look extremely cool and they are very, very useful. 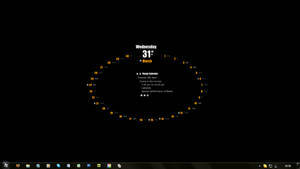 The trick is done by a software called "Rainmeter", which you can download here: [link] . Don't get confused with the whole "this isn't supported" thing. You can still download it. 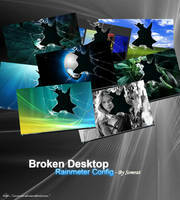 Just click in the "Rainmeter 0.14 (32bit)" option, download and install, and tadaaa! 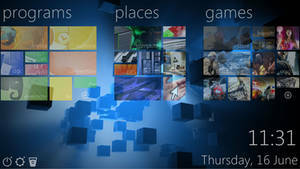 You have now your very own rainmeter. If you'd like to customize the way it looks, that's where [link] comes to save the day once more. You can find a LOT of really cool skins for the Rainmeter there. (The one in the picture above is "Hud Vision"). Changing Rainmeter's skin is very easy, so I'll skip that. -Right click the rainmeter's icon>click the module you want (it should be right there)>uncheck "draggable". Above are "cpu", "network", "batterie", "IP", "system info", among others. 4. ALMOST RIGHT THERE. Then, all that's left is to remove that annoying "recycle bin" shortcut from your desktop. How? This page breaks down the magic: [link] . Then all you have to do then, is to find a fitting wallpaper for your brand new, pimp'd desktop! Hope you found this guide useful! Please post your results and any questions you have! Remember, it took me 5 hours because there was no guide, so you may end with satisfying results in a lot less. Rainmeter got renewed to a better version. It still works pretty much the same, and the link provided takes you to the google's download page. Download and install as usual, change skins by adding them to the 'skins' folder, everything's the same. It's just a new interface and a cooler looking default skin. Fixed all the grammar, spelling and context mistakes. My english was hideous back then. Quick question - how do i save the theme i made? i spent hours doing one then whilst trying to save it i deleted it... and now i have to do it again. if anyone knows could you please message me. BTW, if you don't like messing with your registry to delete the recycle bin to hide it, you can just right click, Arrange Icons by, then Hide desktop icons. It doesn't delete the recycle bin, but it DOES hide it, ending up with the same effect. "The fan effect is a little tricky, but luckily there's a video where it is explained very well. The curve/fan effect is called "stacks docklet", an extension of Rocketdock. You can watch the video (first link) for an installation guide. The second link is the download page. Damn that looks like a CPU hog! Love it! it looks great, awesome job! Will this also work on windows 7? I was just curious because you said XP themes. How the heck did you get rid of the recycling bin? hmm but when i extract the stack folder, a regualr folder pops up..then i go to rocket dock<add item then i click on the folder, but it just goes to "installstackdocklets2.exe"
do i click on that? Can this be done in windows 7? The software downloads can be performed, however, the skin changes and shell mods are exclusive of windows XP (at least regarding this tutorial). the tutorial is for xp. i'm sorry. just updated it, thanks for notifying me. what if you use Vista Eternity? can you still use UXTheme Multi-Patcher [it says for XP]?? This will make me sound like a total noob .___. But do you know how to install LiteStep in Vista Ultimate? I've googled stuff, but it just made me more confused with all the LSDistro and stuff. well, I don't know the program myself, but it seems pretty easy. just download the installer and look for themes in the links to the right. AWESUM customizing there dude.. i'm running the same HUDVision skin on my desktop.. but i'm not able to figure out how ur rocketdock isn't in a vertical or horizontal path.. i searched for an option in the docksettings to obtain a curved dock path like what u hv done here.but i cudnt find nething.. cn u help me out with that..
you mean, the fan effect? yuppz.. datz the one.. thanx a lot... wil upload a desktop screenshot of my own soon...will def. need 2 put in ur name in it as well.. ..thnx again..
can you do this in vista?